Adis says: The Comic Spotlights are back, this time featuring Catherine Harrell, author of Jen Comics. So... Jen Comics. Describe your comic to the webcomic readers on the lookout for a new strip. 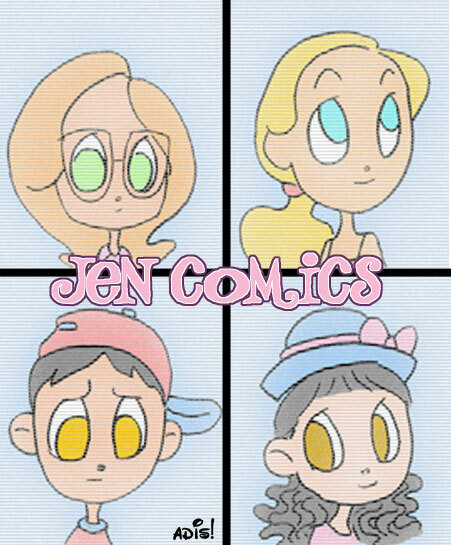 Jen Comics is a humor strip about four children named Jen, Madison, Sparkle, and Avery. The strip follows their daily adventures and offers a kind of warm and friendly look at the world. The comic uses a soft, pastel color scheme and is updated daily. Right away, your comic looks different from almost everything out there. Is this deliberate, or is it just you? I can't somehow picture you doing a comic about videogames. I really didn�t know what was out there when I started, so I suppose I was original by accident. I didn�t give much thought to characters or premise when I first began, so the strip developed on its own for awhile based on whim. Although lately I�ve been working more closely with where the strip is going, I�d like to keep some of that freshness. As for all the other stuff, I�ve never actually owned a videogame. I suppose that�s why Jen�s world has a pretty different focus. Where do the idea for your comic come from? I used to be very methodical about my ideas, and I would think really hard and script everything out beforehand. But I find that the strip is much more energetic and interesting if I keep a healthy sense of spontaneity. I�ll notice something in a book or magazine that strikes me, or I�ll pick up a phrase from a conversation I have. I try to choose a small topic, like a game of basketball for instance, and expand on it as much as I can. Actually the problem seems to be that there is too much to write about, rather than not enough. It�s hard to pick the right idea from such a whole world of choices. Tell me a little about your background in cartooning. Your approach feels both expressionistic and traditional. I�ve had a little bit of training in drawing from life, which is helpful even for a simple style like Jen Comics. The strip isn�t meant to be especially realistic, so I try to get the idea across with quick, clean drawings. That�s probably where the traditional/expressionist blend comes about. I drew a lot as a kid, naturally, but my background in cartooning is mostly limited to quirky humor strips like this one. I haven�t had much experience with other styles, to be honest, but recently I�ve been taking more risks with my drawing style and would like to try expanding on my cartooning ability. Actually, the general response has been surprisingly positive. I posted on a few message boards and got some nice feedback from other cartoonists, and I even got a piece of fan art and a few complimentary emails. People seem to like the quirkiness of the writing and the use of pastel colors in the artwork. Of course, not everybody has liked Jen, but even the negative responses have been incredibly helpful for improving the strip. Generally, I have been very pleased with the honesty of the internet, and I�m working to expand my audience to receive even more feedback and opinions. Why do a webcomic in the first place? I started out knowing next to nothing about the internet or webcomics. I simply thought it would be fun to post my cartoons online, since the idea of having my own website always interested me and I had been drawing for quite awhile. Since then I have learned a great deal about internet cartooning, and enough about web pages to piece together my own site, primitive as it is. The internet is a great place for Jen. I love even the small amount of feedback I have received so far, as well as the ability to easily show my drawings to anyone. I especially like having a little place of my own for the strip, my own spot online. In some instances, an author pours her/himself into the work. I got the feeling, from the first time I read Jen, that reading it was like knowing you. how much of yourself is in the comic? I think a lot of Jen is vaguely autobiographical. Some of the stories are based on real events of course, like the sunburn story and the prima donna, and the characters themselves borrow traits from myself and people I know. In fact, if you put all the characters together, you would probably get somebody like me. I seem to have Jen�s curiosity and energy, Madison�s quiet thoughtfulness, Avery�s bookishness, and Sparkle�s optimism. The tone of the strip is something I�m constantly working on, since I want it to reflect innocence and curiosity without being overly cutesy. As the strip continues, I would like to express more of my thoughts and ideas through the comic. Due to how particular your comic is, I'd like to hear about your influences (comics and outside) and your favorite webcomics. My major cartoon influences must be Bill Watterson�s �Calvin & Hobbes,� Bill Amend�s "FoxTrot", and Charles Schulz�s "Peanuts". These were the strips I read most frequently when I began drawing, and Jen naturally adopted some of their techniques. Outside of comics it�s difficult to say. A lot of books and movies and such have probably influenced Jen, but I don�t know if I can pick out specific ones. It's almost as if I borrow a tiny bit from everything I see. I would imagine that once the strip becomes more defined for me, its influences will emerge more clearly. As for webcomics, I�m a fan of Count Your Sheep of course, and I regularly read Sinfest and girly and Order of the Stick. There are also a number of strips I read peripherally, looking around at new comics when the mood strikes. What's in the future for Jen Comics? I think Jen is going to become more cohesive over time. The characters are becoming more defined, and I�m starting to get a feel for what I want the strip to look like. I hope to continue updating daily and maybe promote the comic a little across the internet. I may also try new things with art and writing, possibly drawing a few short comic stories in addition to Jen. If Sparkle and Laurie went out for coffee, what would they talk about? I imagine Sparkle would blather on for awhile about herself and her dreams of becoming a big, famous movie star. Then they might find some common ground in practical things like shopping or favorite foods�and now that Marty is in the strip, who knows, they could even talk about boys. Sparkle would probably be intrigued by Laurie�s relationship with Katie, and she might go buy a doll or puppy and pretend to be its mother for awhile. (Actually, that�s not a bad idea for a strip.) By the way, Sparkle would also find Ship absolutely adorable and would coo over him and dress him up until he became quite annoyed. Thanks to Catherine for her time, and whenver the mood strikes, go check out Jen Comics!